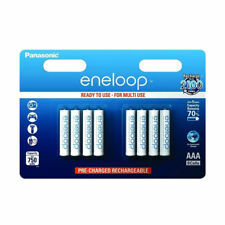 Panasonic eneloop batteries were previously known as Sanyo eneloop. AAA size batteries are also known as HR03, LR03 MN2400, LR03 etc. That's one reason why you can take more photos with eneloop. Following the acquisition of Sanyo by Panasonic in 2013, the fourth and latest generation of Eneloop was introduced in April that year. 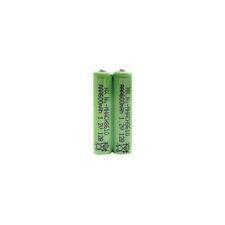 2 X ULTRAMAX NP7-12, 12V 7AH. Also Fits most well known Bait Boats - Waverunner, Viper, Lakestar etc. TOY CAR BATTERY. Low pressure relief valve. FULL 12 MONTH WARRANTY ON ALL OUR BATTERIES. ALL BATTERIES HAVE A FULL 12 MONTH WARRANTY . 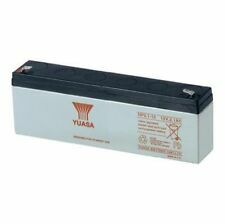 Yuasa NP7-12 Sealed Lead Acid Battery 12V 7Ah. 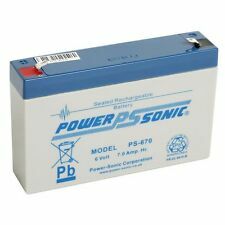 12 Volt 7Ah sealed lead acid battery, latest battery technology. Yuasa Batteries. Battery size Length =151mm Width =65mm Height =94mm. F1 battery version has Faston connectors 4.7mm wide. Rugged construction - the impact-resistant battery case is made of non-conductive ABS plastic or styrene, providing excellent resistance to shock, vibration, chemicals and heat. Universal Battery UB645. Nominal Capacity : 200mAh. 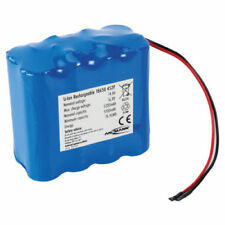 Summary : Excellent IFR Battery with real tested capacity. 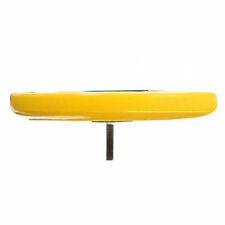 Features : Widely used in Solar & Garden Lights ,Cat Scarers. Color : Blue, Gold. Weight : 13 gr.max. ONLY FOR USE WITH SOLAR OUTDOOR LIGHTING. BL 14430-400. Pet Supplies. The fastest selling UK custom battery wraps! High performance, custom built 2V cell using the unique technology of spirally wound electrodes made of pure lead. 15 Year design life (float). High rate performance and cycle life. Contents: Battery only. With short circuit protection and anti-overcharging function. -Cooling:Forced cooling (built-in fan side). Detail Image. We will try our best to reduce the risk of the custom duties. Features: Ni-Cd battery, it has good high current discharge characteristics, with strong resistance to overcharge and discharge, easy maintenance. Rechargeable design with KET-2P plug, easy to use, plug and play. High capacity and long battery life, perfect replace your broken battery or just use as a spare pack. Good product with superior material, durable & practical, and not easy to damage. Suitable for car/boat model toys, remote control toys, lighting, security facilities, electric tools etc. Specifications: Voltage: 9.6V Battery Type: Ni-Cd AA battery Battery Capacity: 800mAh Package Includes: 1 x RC 800mAh Ni-Cd Battery. PRICED PER BOX OF 2. Sealed Lead Acid (SLA) - TOTALLY SEALED AND SAFE WITH ONE YEAR WARRANTY. maintenance free, non-hazardous and non-spillable because acid in it, is in the form of Liqui-fix GEL. Bungs (Plugs) are only for transportation use. 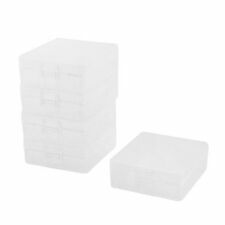 Portable hard plastic case holder storage box. Made of hard plastic, practical and durable. The ideal way to safely carry your spare 9V batteries. 1 x Battery Box. - Made of hard plastic, practical and durable. Yuasa NP Range. Heavy duty lead calcium alloy grids. Designed for float or stand-by use. Valve regulated, sealed lead acid maintenance-free batteries. Incorporates a pressure safety valve. Five year design life. ONLY FOR USE WITH SOLAR OUTDOOR LIGHTING. Lithium Phosphate 18500. 1000 mAh/3.2V/3.2W/h. Pet Supplies. Output: DC1.4V, AAA/AA 2=160mA. Flip the buckel to switch between AA AAA battery size. With LED indicator. Compact with light weight, easy to carry. If item is defective after 3 months, you can still send it back to us. Sealed Lead Acid Battery for a wide range of uses. 12v 2.1Ah Sealed Battery. Mostly used as burglar alarm battery in panel units and bell boxes in the security industry. We are only human, and occasionally things do go wrong. Features: Ni-Cd battery, it has good high current discharge characteristics, with strong resistance to overcharge and discharge, easy maintenance. Rechargeable design with KET-2P plug, easy to use, plug and play. High capacity and long battery life, perfect replace your broken battery or just use as a spare pack. Good product with superior material, durable & practical, and not easy to damage. Suitable for car/boat model toys, remote control toys, lighting, security facilities, electric tools etc. Specifications: Voltage: 7.2V Battery Type: Ni-Cd AA battery Battery Capacity: 800mAh Package Includes: 1 x RC 800mAh Ni-Cd Battery. RITAR RT12100. batteries-direct / Ritar batteries. We have a wealth of experience with Sealed Lead Acid batteries. Deep Cycle - Long Service Life. 12 MONTHS WARRANTY. The electronic load was set up to take 460 mAh from the batteries. shows none of them claim to be able to produce batteries over 2850 mAh. The graph shows 3 sets of batteries I tested. Ultra Light High Performance. These Batteries are the. ALL OUR BATTERIES CARRY A FULL. For standby power this range has a nominal 5 - 8 year life. 12 MONTH WARRANTY. & LASTS UP TO 10 X LONGER. We are only human, and occasionally things do go wrong. Renewable Energy. Rugged construction - the impact-resistant battery case is made of non-conductive ABS plastic or styrene, providing excellent resistance to shock, vibration, chemicals and heat. Universal Battery UB645. In good working order 700ah 2V battery cell. Collection with cash only. Based in Halifax, West Yorkshire, but not far from Bradford, Leeds and Huddersfield, we are only a short drive from Lancashire. TOTALLY SEALED AND CAN BE USED IN ANY POSITION. For details of how to reach us, see the find us page. If you have the iDect V2i Twin, iDect V2i Trio or iDect V2i Quad phone sets don't forget to increase the quantity of batteries you need. This battery is the exact fit and has the correct plug for the iDECT V2i phone with answering machine. Capacity 150mAh. Chemistry Nickel hydride. Fuses & Circuit Breakers. Soldering Iron Stands. Battery Size 150H. Door Furniture. Product Information. Size 42.4 x 17 x 16mm. These powerful batteries are ideally suited for clocks, walkie-talkie's and children's toys. Now you can satisfy all of your portable and personal electronic needs, and still go green. LUCAS LSLA2.3-12 12V 2.3AH (2.1Ah). Bungs (Plugs) are only for transportation use. 12V 2.3Ah Sealed Lead Acid / VALVE REGULATED LEAD ACID (VRLA) Battery. This battery is used in majority of Intruder alarm panels including. Capacity : Nominal 650mAh(Minimum 630mAh). Ambient Temperature Range. Model: Li-7.4V-650S. Bar Code: 6951151510211. New, valve regulated, 12V sealed lead acid maintenance-free battery. Weight : 1.12kg. 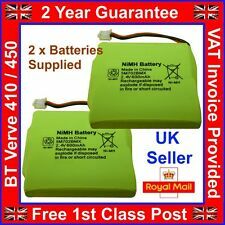 2 x Brite Source Sealed Rechargeable Battery KRMT33/62 3.5v. Condition is New. Dispatched with Royal Mail 1st Class. 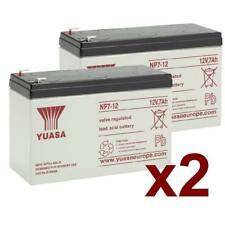 Yuasa NPW45-12 Sealed Lead Acid Battery 12V 45W. 12 Volt 45W sealed lead acid battery, latest battery technology. Yuasa Batteries. Battery size Length =151mm Width =65mm Height =94mm. F2 battery version has Faston connectors 6.4mm wide.